A High Tea is a grand institution in my life. It is something my mother instilled in me from a very young age. It is the coming together of people in the perfect setting to relax and enjoy a cup of tea while enjoying each other’s company. It is an occasion where every aspect is its own piece of indulgence and elegance. The drinking of tea is literally the icing on the cake. 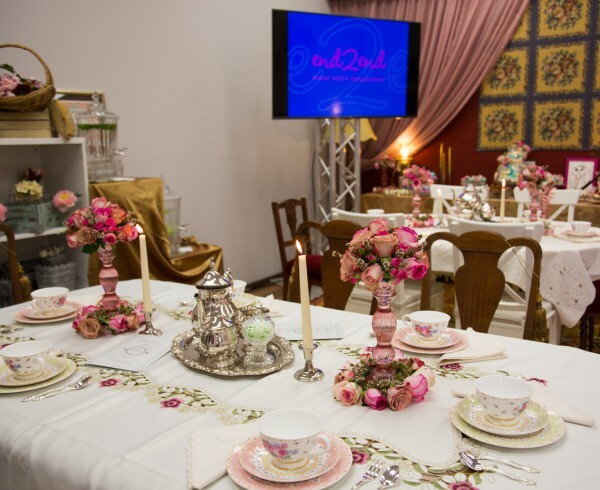 I always take the greatest pride in putting together a High Tea and was able to showcase what I consider to be my kind of High Tea at the Opening of the End2End Events showroom on 10 March 2016. Guests were greeted to a High Tea setting that took them back in time and place. They traded conversation over fine bone china, sandwiches, canapes, scones, and petit fours all perfectly arranged on tiered cake stands. The Arabian tent in front of the showroom served as the Low Tea area, meaning guests enjoyed sampling Arabian tea and dessert on low seating options such as ottomans and coffee tables. Serving as a more relaxed meeting place, the Arabian-inspired décor and Low Tea settings provided a sanctuary of elegant Arabian and Persian teas served in the finest stemmed glassware. Music from Wicked Strings – String Trio greeted guests and accompanied their elegant High Tea experience as they were later treated to a fine High Tea setting with lace tablecloths, fine china and fine cutlery. Bellydancers from Bedazzled Bellydance completed the afternoon and added that extra special pizazz to the atmosphere that adorned the E2E showroom, showcasing what makes the team at End2End Events so special to work with. But what do you ask, is the art of a truly sophisticated High Tea? It is in the art itself – the art of creating an atmosphere where guests feel they are at a special occasion in a perfect setting. The art of High Tea is all in the preparation! The history of High Tea is a tale drenched in decadence and one that dates back to the 18th century. High Tea originated from times when working class people arrived home late and were well and truly ready for their evening meal. High Tea became known because of the high seats at which this tea was taken. Soon, the High Tea became less of a meal for the working man and one known more as an event on the social calendars of ladies and gentlemen. A culinary delight to enjoy and impress. It allowed the opportunity for a substantial meal before attending the theatre or other notable events before a supper could be taken. The High Tea sandwich has had its makings from the Fourth Earl of Sandwich, John Montagu, whose claim to notoriety was placing meat and other fillings between two slices of bread. The High Tea tradition is one that has been modified without being modernised. A High Tea can be taken in any environment, so long as there is the ambience to create the atmosphere for your guests. Vintage or modern crockery mingles with savoury or sweet delicacies. Bite-size portions in the form of canapés will always create the elegance you are looking for. It is then a matter of matching colours and textures to your décor that will surely create a talking point amongst your guests. Remembering always, that the tea is the highlight of this setting. It is, of course, the elegance of the cups, saucers and side plates that are used to match your teapot that creates the ambience. So, when variety is the spice of life, a High Tea is the discerning touch that brings variety into one delightful setting. At End2End Events, the High Tea is but one piece of what we offer. Your next corporate event, embassy function or special occasion is catered for by a team that has the passion and experience to organise stylish, unique, boutique-style events. Talk to us today and Let us help you tell your story through the creation of a memorable event.